However, some tobacco chewers, especially children and adolescents, don't comprehend tobacco dangers until they are into their late teens if at all and by that time might have been chewing for five or ten years. Research suggests the success rate for tobacco cessation in a health practitioner's office is somewhere around five percent. But that does not mean that there is a ninety-five percent failure rate! The person who receives the quit message may not, and probably won't, quit immediately, but, he may get the same message from others like a nurse, his wife, a friend or others and later reflect about what was told to them. Health professionals shouldn't grade themselves on how many people they can "get" to quit, but rather how many times they give the message when the opportunity arises. While about 75% of health providers think it is a good idea to tell patients about tobacco dangers, only about ten percent routinely do so. Research shows that the reasons they don't get involved are a combination of not feeling confident about the subject, questionable goals of doing so, afraid of a negative reaction from the patient, feel that the patient would be offended, there is not enough reimbursement to get into cessation or they just don't have enough time. Asking whether or not they know how dangerous spit tobacco is, often brings the surprise reaction that they don't know that smokeless is a health risk. If the patient doesn't use tobacco, a professional can take a moment to congratulate them for non-use, tell them their own position on the use of tobacco, and solicit a promise from them that they will never use tobacco. If we can keep a child away from tobacco until they are about eighteen, there is a very good chance that they will never use tobacco. 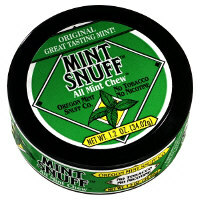 Kids usually get their first "dip" from a friend or family member. Shockingly, some kids have admitted they are willing to risk their health in order to have the circle on their back pocket or to just "fit in" with other young chewers. Trying to compete against this peer pressure or social imagery can be perplexing for health advisors. Dealing with the social and behavioral aspects can be tough. For kids who chew for social or image reasons, a professional can either try to convince them to quit "cold turkey" or offer an alternative that provides them the same social imagery and behavior but is harmless. Some of these alternatives are sunflower seeds, bubble gum and sugarless candy which, although somewhat acceptable, don't offer the same perceived benefits as their chew. By giving a chewer Mint Snuff, a professional is meeting the user "half-way" and providing a positive experience during the intervention phase. Naturally, it's better if the chewer didn't do the behavior at all, but if they are going to chew anyway, it's better they used mint instead of tobacco. The availability of an alternative greatly increases the health professional's chances of helping their patients quit tobacco. Rather than hand-wringing and chanting "you should quit" they can say: "try this!" Different social, cultural and behavioral influences have raised new challenges for intervention and cessation techniques. A cessation method that works in one state or community may not work in another. For instance, a young chewer in North Carolina might, sociologically, have radically different needs than a chewer in Arizona because tobacco is part of the economic base of the community. "Uncle Joe grows tobacco...it can't be bad!" 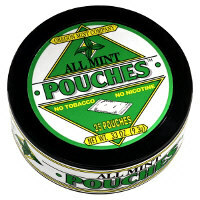 Another interesting example is Alaskan Indians, who would use Mint Snuff instead of tobacco as long as it was provided free - but when they had to pay any amount of money for it, would chew tobacco instead.